Bakari Carneiro nasceu em Angola em 1992, tendo vindo para Portugal com apenas quarto meses. Depois de assistir à sua primeira festa de drum and bass em 2007, revelou um interesse especial neste género e no género do dubstep. No inverno de 2009 adquiriu o seu primeiro conjunto de gira-discos e em 2010 começou a tocar em festas oficiais no Porto e em Freamunde como Atomic. Desde essa altura, Atomic progrediu rapidamente e já tocou com nomes tais como Benvinda, Cabbie, Callide, Crissy Criss, D Element Q, DJ Oder, Migdrum, Propaganda, Sobass, Soundproof e Surface. As suas principais influências são Callide, Caspa, Danny Byrd, Delta Heavy, Dirtyphonics, DJ Oder, DJ Panik, Doctor P, Flux Pavilion, Nero, Netsky, Original Sin, Skrillex, Sub Zero, Subfocus e Tantrum Desire. Bakari Carneiro was born in Angola in 1992, having moved to Portugal when he was only four months old. After attending his first drum and bass party in 2007, he began revealing a special interest in this genre and in the genre of dubstep. 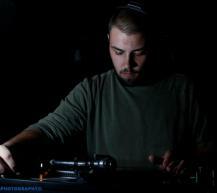 He acquired his first set of turntables in the winter of 2009 and in 2010 began playing at official parties in Porto and Freamunde under the name Atomic. Since then Atomic has progressed quite rapidly and has already played with names such as Benvinda, Cabbie, Callide, Crissy Criss, D Element Q, DJ Oder, Migdrum, Propaganda, Sobass, Soundproof and Surface. His main influences are Callide, Caspa, Danny Byrd, Delta Heavy, Dirtyphonics, DJ Oder, DJ Panik, Doctor P, Flux Pavilion, Nero, Netsky, Original Sin, Skrillex, Sub Zero, Subfocus and Tantrum Desire.